The Chariot of Greenwich is based on the Chinese South-pointing chariot, an ancient apparatus attributed to the Yellow Emperor, c. 2,600 BC. The legend tells of a chariot that has the characteristic of always pointing in the same direction, regardless of how it is moved. Centuries later in England, around the period when the Royal Observatory in Greenwich was established as the location of the prime meridian, the engineer George Lanchester offered his interpretation of the Chinese invention. He proposed that the only way this could ever be possible is by the use of a differential engine, thus marking a parallel between the ancient Chinese mythical machine and British engineering, but also dismissing any importance that the machine could have had as piece of magic or as a symbolic device. The Chariot of Greenwich is a large rendition of Lanchester’s interpretation. A stick-and-carrot positioning of a clock pendulum replaces the figure of a South-pointing man ascribed to the original apparatus. A motor concealed in the front of the chariot makes it spin constantly. 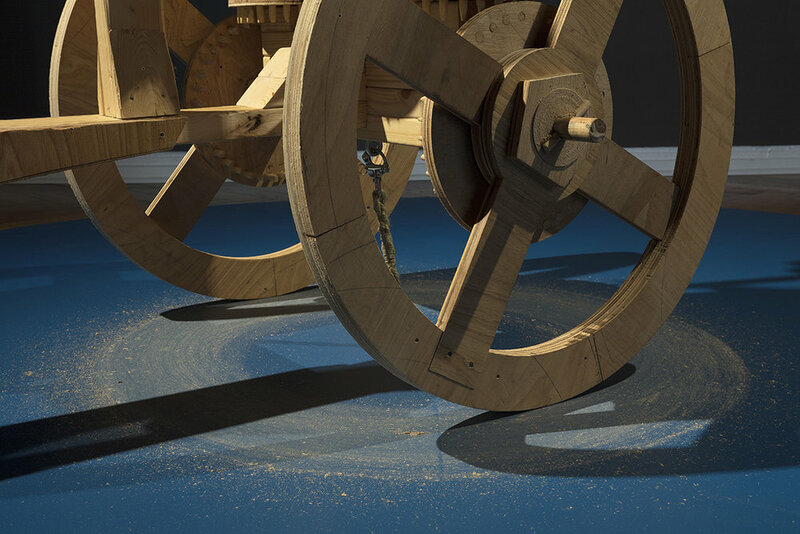 The movement exhausts the gearing in the chariot, producing a shrieking sound and leaving behind a circular trail of wood residue.